Article first published as 5 Key Takeaways from Lifecycle Messaging Conference on Technorati. The Lifecycle Messaging Conference was held held October 9-11, 2013, in San Diego, California at the Omni San Diego Hotel, located in the heart of San Diego’s historic Gaslamp District. The focus of the 2-day conference was helping companies implement advanced lifecycle messaging programs to bring their email marketing program into the modern world. Summed up in the tagline: “Email Marketing in an Omni-Channel World.” Conference sponsors and host Blue Hornet is an enterprise email service provider and part of Digital River, Inc. (NASDAQ: DRIV). There were remarkable keynotes by noted authors and marketers Mitch Joel – Author of CTRL, ALT DELETE, Jay Baer, author of Youtility and Simms Jenkins author of The New Inbox. The conference focused on email marketing, but invoked all of the tools and platforms of digital marketing including mobile, social media, SEO, SEM, paid media, ecommerce and more. Topics presented and discussed surrounded the challenges, issues and power of email marketing to drive KPI’s and ROI. 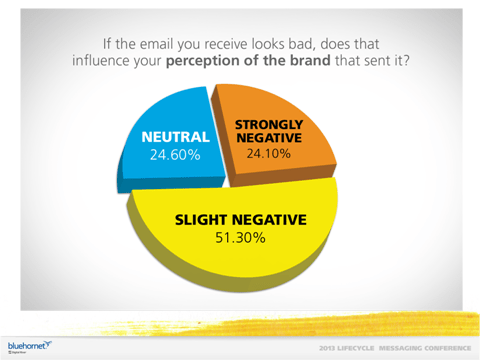 As a person no longer directly involved in email marketing, I was struck by a few key takeaways that transcended any single presentation or message. These themes resonated in most of the presentations, and just as importantly, dominated conversations between each session. Takeaway 1: Mobile is the Future and the Present. One Screen To Rule Them All. There is one screen. All that matters is the one screen in front of you at that specific moment. Data showing the dramatic affect mobile has already had, and will continue to have, in email marketing was stunning. Recent surveys show that up to 88% of your email subscribers will either DELETE or UNSUBSCRIBE from your entire email list, based solely on how your email LOOKS on their mobile device. Current numbers show that approximately 50% of ALL emails are now read on a mobile device. This provides all the ROI you will need to run as fast as you can to responsive and adaptive design for mobile. Amid active discussion about the role of mobile in email marketing, some attendees still maintained that designing for mobile was fine for ‘early adopters’ but wasn’t yet ‘mainstream’. Several companies mentioned that they were not seeing high levels of conversion or purchases from mobile. However miraculously, those companies with existing full mobile support in their customer funnel, verified they were seeing strong and growing mobile conversion and revenue. Before you decide that mobile users don’t convert or buy, make sure your entire funnel both functions well, and looks good on mobile. It is no longer a question of when, and it’s clear that last year was the “year of mobile”. If you are not already focused mainly on mobile you are already losing relevance and revenue. Read the rest of the article on Technorati: 5 Key Takeaways from Lifecycle Messaging Conference on Technorati.